This post was written by PR 20/20 intern Emily Dann (@EmilyRDann). Emily is a dual major studying Public Relations at S.I. Newhouse School of Public Communications as well as Marketing Management in the Martin J. Whitman School of Management at Syracuse University. Today’s consumers have a digital-first attitude, relying more on their social media inbox for news than old-school snail mail. That means we as marketers must accept that traditional tactics like direct mail and cold calling are no longer viable options to reach our digitally savvy audience. Luckily for us, rapid advancements in marketing automation technology present new opportunities to revamp our marketing efforts. And, in an era of widespread adoption, there’s no surprise that 58% of B2B companies plan to explore marketing automation if they haven’t already. According to PR 20/20’s marketing assessment tool and intelligence engine, Marketing Score, those who have adopted marketing automation report high performance. In fact, marketing automation high performers have an average lead to sales conversion rate of 6.1, which is 1.6 times the average rate of all others. These high performers rate cost of customer acquisition (COCA) 1.4 times stronger, and have an average overall Marketing Score of 61%, 1.5 times all others. Serving more than 23,000 customers in 90 countries and with revenue reaching $271 million in 2016, the HubSpot platform empowers marketers with the tools to drive performance-driven campaigns and automate the marketing and sales process to better reach target audiences. As a result, you’re able to maximize the customer experience, gain more intelligence on audiences and stimulate company growth. That said, HubSpot (or any marketing automation tool) doesn’t magically generate leads and increase site traffic on its own. Today’s marketer must understand how to strategically use specific features within the HubSpot portal in order to run dynamic campaigns and maximize ROI. Read on to learn how you can use HubSpot to boost efficiency for measurable, bottom-line results. 1.Customize your dashboard to suit your needs. The Dashboard is the first screen you’ll see after signing into HubSpot. Here, you’ll find a summary of email, blog, landing page and overall website performance. Customize report date ranges to set individual parameters for each dataset and view metrics from specified timeframe. Filter individual reports to specific users to cater to each team member’s goals. Compare pipelines side by side. To further enhance the user experience, HubSpot allows you insert, delete, move or resize any of the reports on your Dashboard to best suit your needs. 2. Enhance the user experience with smart lists and content. Segmenting your audience has never been easier. If you’re not familiar, smart lists are dynamic and filter in only those contacts that meet predetermined criteria. By creating smart lists, you’ll avoid manually adding contacts one by one and classify leads based on their website behavior. Once you’ve created smart lists, you’re ready to deliver smart content and smart calls-to-action. With these optimization features, marketers can better tailor content based on visitor industry, buying stage, geographic location or device type. Still not fully convinced? HubSpot reported that targeted CTAs performed 42% better than generic CTAs, proving just how much you could benefit from leveraging marketing automation tools. 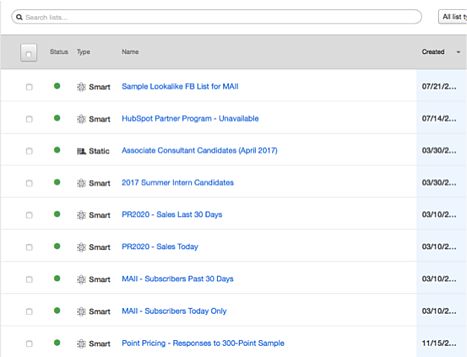 In short, HubSpot’s smart tools can help you put the right content in front of the right people at the right time for maximum impact to your bottom line. 3. Create workflows to streamline internal and external communications. HubSpot’s integrated platform also helps companies streamline internal processes. Once triggered by a content download or form submission, workflows send a series of automated emails. 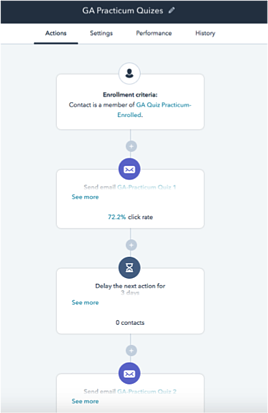 Marketers can create workflows to nurture new leads, maintain relationships with existing customers, and re-engage with closed or lost contacts. We’ve experienced a shift in power from the marketer to the consumer, which is why investing the time in creating nurturing workflows at each stage of the buyer’s journey might be the key to driving up customer loyalty and revenue. Workflows can also be useful for non-marketing activities. For example, users are able to enhance partner communications or the sales process by sharing information using a password-protected hub. Within the hub, users can house personalized sales collateral, downloadable resources, documents or sample work, granting easy access to digital assets for all team members. As mentioned previously, workflows help improve internal processes and increase transparency between your marketing and sales teams. With automated notifications, your sales team will know as soon as a marketing qualified lead (MQL) transitions to a sales qualified lead (SLQ), or when a prospect has completed a specified action on your website. 4. Leverage reports to optimize site content. While you’ll find snippets of performance reports on your Dashboard, you can take a deeper dive into site analytics under Reports. With this tool, you can determine which emails, blog posts, pages, keywords and site content are performing best. From there, you can tailor content around your visitors’ interest. But, is there a way to prove positive ROI from marketing campaigns? Indeed, there is. By using the Sources tool under the Reports tab, you’re able to monitor which channels are generating the most traffic to your site or calculate ROI by determining which marketing campaigns are generating the most leads and customers. Then, you can direct your efforts to the most successful channels to maximize ROI. With the help of HubSpot or a similar marketing automation tool, you can maximize ROI and support outcomes with real-time data. After reading this post, you’re now equipped with the right knowledge to leverage these features and improve your bottom line. So, if you have yet to explore HubSpot, what are you waiting for? 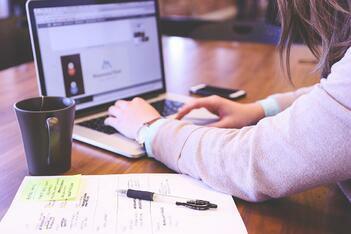 How do you ensure you’re getting the most out of your marketing automation software? Share in the comments below!